Transport workers brought most of Paris and the Ile de France region to a halt today, they were joined at demonstrations by other workers and strikers. The one-day strike was originally called by the main rail unions in protest at the end of 'special regimes' for pensions. They were joined by other strikers such as medical interns, by workers, from EDF among others, facing the same attacks on conditions and by workers from other industries, such as car manufacturing. In Paris only the automated line 14 ran a full service, the RATP expected to run one in five trains on line 1 and a third of trains on line 2; the bus service was supposedly running at 10% capacity and the five suburban lines were almost entirely out out of operation with management not even attempting to run services on the two most popular lines. The strike is the biggest in France for 15 years, Nationwide the TGV system was almost entirely shut down as were other intercity rail services. Most cities in France saw widespread disruption with at least 130 demonstrations across the country. In Paris and other cities many workers chose to join demonstrations either in solidarity or to make their own demands, rather than try to get to work. According to spokesmen 73.5% of SNCF workers (railways) joined the strike, compared to 67% at the height of strike action in 1995. RATP (metro, bus suburban rail) reported 58% observance; EDF 51.9%, 8% of civil servants and 10% of teachers. The government responded with tough talk, but this massive mobilisation is a sign of a series of hard battles to come for both sides. The Sarkozy government's policies will bring them into direct confrontation with all of France's unions over the next few years and a victory here will be very significant. The CGT are estimating that 25,000 strikers took to the streets in Paris (although this seems like an underestimate to me) and the governmet seems heartened by the fact that although many people did not go to work, many of them did not join demonstrations either. The CGT union is estimating 300,000 demonstrators in France, the police are claiming that numbers were closer to 150,000. The one-day strike looks to continue, workers began calling general meetings during the day to continue the strike action. 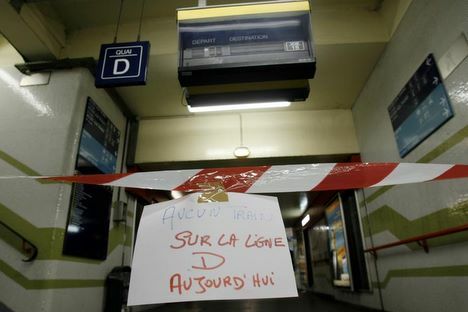 The RATP is predicting that only one in three metro trains will be operational tomorrow (Friday). Reports are confused but four unions, FO, SUD-rail, Unsa and FGAAC have been reported as announcing that strike action will continue. FGAAC has also been reported as having withdrawn it's notification of strike action for tomorrow, citing 'concessions' made by management. Unsa is widely reported to have called for a continuation of strike action only after large numbers of its members voted to strike at general assemblies. According to Christian Mahieux of SUD-rail general assemblies at stations in Paris, Marseille and Lyon voted 95% in favour of continued strikes tomorrow. The CGT, one of France's biggest unions, has refused to call for strike action to continue tomorrow. The CGT had a very large presence at the strikes today, with groups of workers from other industries well represented (assuming that all those behind banners were from the company/industry stated).